What is afp file? How to open afp files? The afp file extension is associated with the Advanced Function Presentation, a platform for printing variable data at very high speeds with complete integrity. AFP incorporates other industry formats, including EPS, PDF, TIFF, GIF, JPEG (JFIF), XML, and PCL—to cover the entire range of text, image, graphics, process color, highlight color and monochrome printing. The afp file stores various data used for internal purposes of the Advanced Function Presentation. This afp file type entry was marked as obsolete and no longer supported file format. 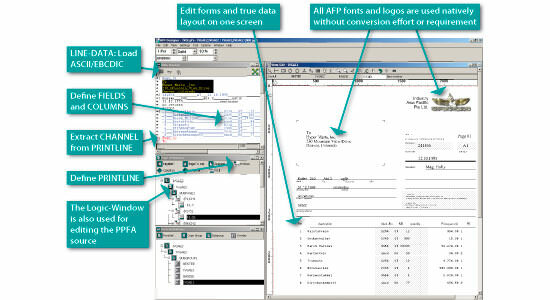 AFP Designer is the industry standard graphi­cal and visual PC desktop design tool for complete AFP print applications. It supports through its dot-perfect design process the integrated development and maintenance of IBM standard OGL and PPFA source code. and possible program actions that can be done with the file: like open afp file, edit afp file, convert afp file, view afp file, play afp file etc. (if exist software for corresponding action in File-Extensions.org's database). Click on the tab below to simply browse between the application actions, to quickly get a list of recommended software, which is able to perform the specified software action, such as opening, editing or converting afp files. Programs supporting the exension afp on the main platforms Windows, Mac, Linux or mobile. Click on the link to get more information about AFP Designer for open afp file action. Programs supporting the exension afp on the main platforms Windows, Mac, Linux or mobile. Click on the link to get more information about AFP Designer for edit afp file action. Programs supporting the exension afp on the main platforms Windows, Mac, Linux or mobile. Click on the link to get more information about AFP Designer for create afp file action. Click on the software link for more information about AFP Designer. AFP Designer uses afp file type for its internal purposes and/or also by different way than common edit or open file actions (eg. to install/execute/support an application itself, to store application or user data, configure program etc. ).